Kathi roll is a very popular snack which originated as Kolkata's (Calcutta) street food. 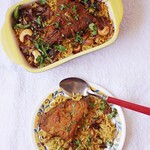 It was introduced by Nizam's, a very popular eatery founded in 1932. Though they started it with their trademark style by using heavy iron skewers. 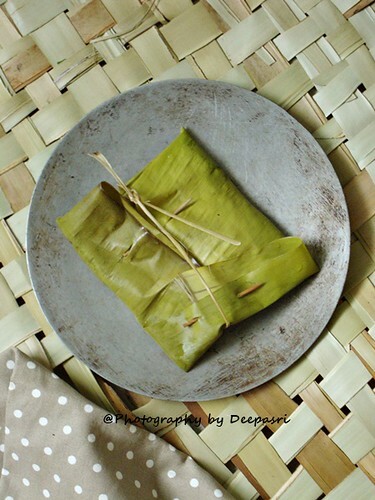 Later they shifted to light weight bamboo skewers and eventually kathi roll became synonymous with any kind of paratha rolled with various stuffings. Kathi roll's popularity is on the rise. So much that it has crossed boundaries and also reached till New York. In Kolkata the roll is half covered in napkin or thin layered paper. Hope you like this taste of this roll as much as I have. Prepare a dough with flour, water and salt. Knead well and if the dough is not soft enough, then rub in little butter and make it soft. Cover and keep aside for later use. In a large bowl add paneer cubes with chopped green chillies, garam masala, cumin powder, kasoori methi, salt, pepper and orange color. Marinate this for 20-25 minutes. In a non-stick pan heat oil, saute onions and bell peppers on medium high flame for 3-4 minutes. Add ginger-garlic paste, tomatoes and saute. 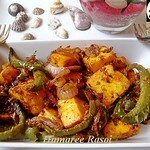 Add in the marinated paneer mixture and saute for 4-5 minutes on high flame. Remove from heat, add chaat masala, chopped coriander leaves and lemon juice. Filling is ready and set aside. Heat a flat bottom grill. Divide the dough into 6 equal portions. 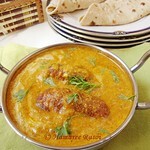 Roll out each portion into thin chapatti and cook lightly on both sides over medium heat. 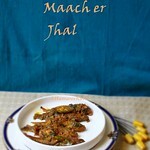 Brush chapatti with little ghee on both sides while frying. 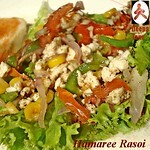 Divide the paneer filling into six equal portions. Arrange lettuce leaf over each chapatti. 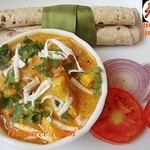 Stuff each chapatti with paneer filling and roll up tightly. 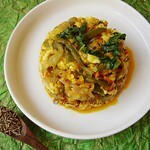 Serve hot with your favorite chutney or sauce. Jay's Letz Relishh -Paneer event. 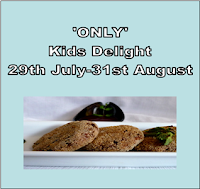 And Pari's Kid's Delight event. Deepa, tomar kathi roll dekhe khete icche korche. 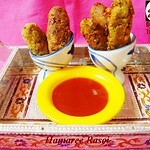 aamar roll favorite snack and I make them often. The rolls are very lovely! It's fabulous! Very delicious paneer rolls, beautiful presentation too. SLurppp!! !makes me drool, fabulous looking rolls..
Looks so very tempting !! rolls looks irresistible and beautiful presentation too. 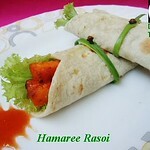 Paneer kathi rolls looks delicious. I love the way you presented though. inviting presentation.. loved these paneer rolls.. 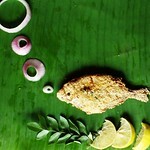 Very innovative and beautiful recipe...loved d awesome clicks...This one's a keeper. 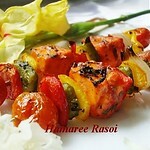 Paneer tikka roll looks mouthwatering..my all time fav..
Rolls look very cute and delicious dear. Perfect for the events too. 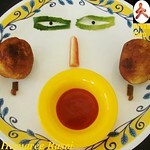 Unique recipe..sounds so good,paneer stuffed rolls..lovely tempting clicks dear. Nice click, looks healthy and yummy, love the stuffing dear..
very healthy and elegant wrap! Ready for the Ball! Wow....my favourite roll....love to have them anytime....i love the way u presented...clove and that green....yummy....i searched for your mail id...but could not find it...r u there in facebook? now i know this really a small world...i stay in 4th cross...."fingers crossed". Colorful and inviting Roll. 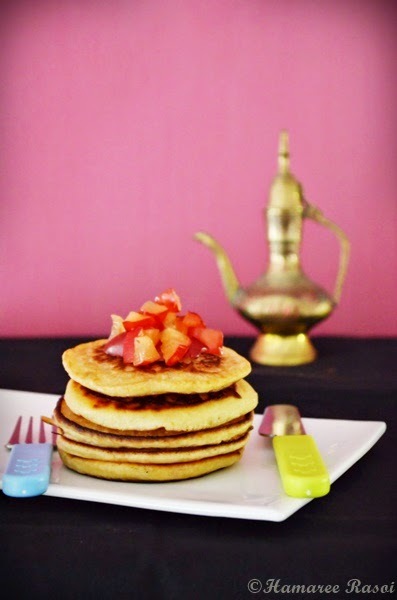 Look soo yummy and Delicious!!! 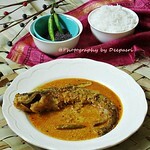 Tumi amar khub bhalo o mishti bondhu tai ami bujhte perechhi je tomar gajorer halwa khub pochhondo. Amio du tin din fridge e rekhe bread diye khai. Paneer kathi roll ta darun baniyechho. 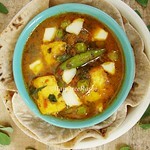 Paneer er je kono preparation amar priyo. Dekhei mone hochhe ekta roll kheyeni.